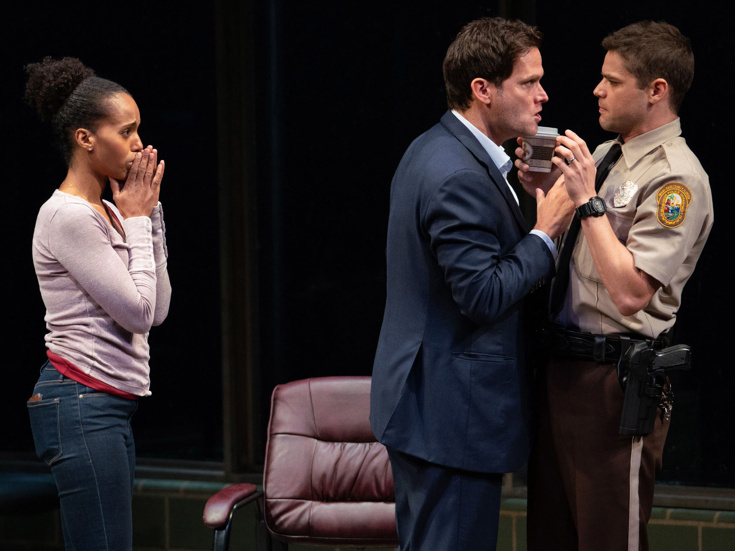 Kerry Washington, Steven Pasquale & Jeremy Jordan in "American Son"
Christopher Demos-Brown's star-packed Broadway-debut play American Son may be concluding its limited engagement on January 27, but audiences worldwide will soon have the chance to see the acclaimed work. Its producers have announced that the play will be filmed, sans audience, for a small-screen adaptation set to appear on Netflix. Directed by Kenny Leon, American Son stars Kerry Washington, Steven Pasquale, Jeremy Jordan and Eugene Lee. "American Son powerfully explores themes of family, love and identity," said Cindy Holland, Netflix's vice president of original content. "We are honored to work with Kerry Washington, Kenny Leon, Christopher Demos-Brown and the entire cast to bring this story from the Broadway stage to our members around the world." The play began Broadway previews at the Booth Theatre on October 6 and officially opened on November 4.